I’m in Kampala! I spend a pretty average evening at Red Chilli Backpackers just outside the capital and am woken up at 4am by my super considerate bunk mate who’s just climbed into bed. I wake up a bit later and decide to hit Kampala to see what treasures it holds – but not before I contact O2 by internet chat to try to find out why they’re still charging me a monthly fee, 2 months after I terminated my contract. This takes an entire day and so I don’t go anywhere. Out in the camping area my heart skips a beat, I see the Beast! Same cruiser, same colour, same roof rack, same tent – alas… it belongs to two fellow overlanders, Oyvind (from Norway) and Sheelah (from South Africa) who started coming down from Norway to South Africa, via West Africa, before realising that it was just too dangerous and not worth the risk. They shipped their cruiser from Senegal to Cape Town and have made their way up through Southern and East Africa to Uganda. They are an awesome couple and it’s so good talking to them after following their blog for months! You can follow their trip here – Kapp to Cape. 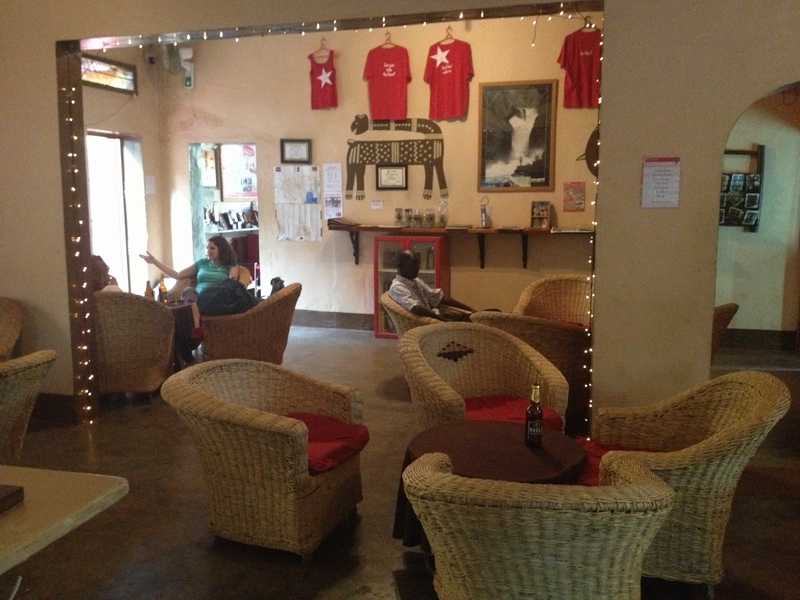 My stay at Red Chilli Hideaway is less than noteworthy, it’s a fine spot to stop over in Kampala and they serve up a good pizza but that’s about it! 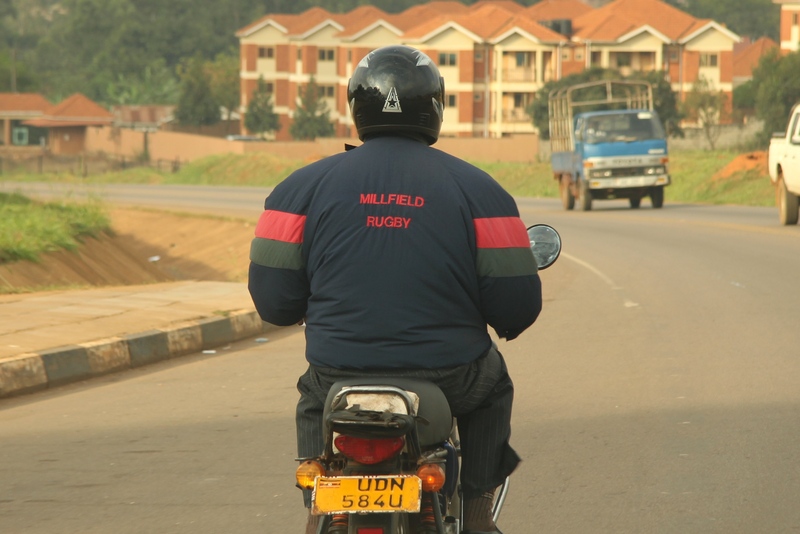 I spotted a Millfield team player a little off the beaten track… wonder if he made the game in time? 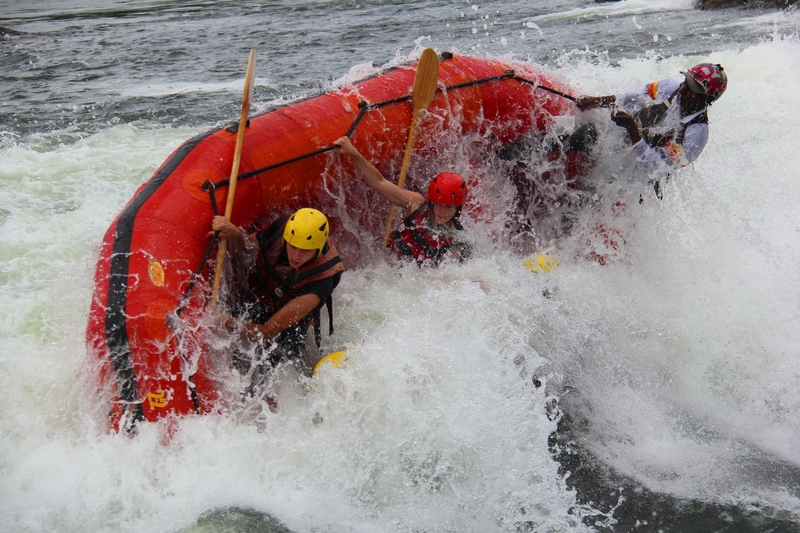 The next day I’m due to get at transfer with the rafting company in Jinja. 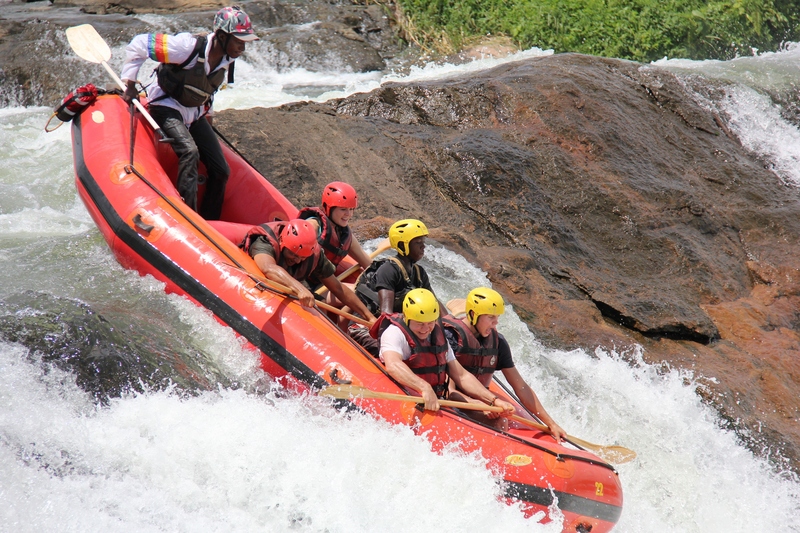 Somehow I miss this and end up flying about the place trying to make a plan to get to Jinja, over 80kms away for my day of rafting… Luckily someone phones a rival company and they agree to take me in their bus instead. I spend the night in Jinja at the Nile River Explorers‘ Camp and meet the manager, Nash, who’s got the most wicked and crazy afro – should take a photo to remember him by but I’m absolutely shattered and head to bed at 8pm. I wake up for a 6:00pm pick up, and hear someone calling through the window of the camp. It’s my guide for the next three days from Safari Wildz. Cosmos is a big burly Ugandan with a deep voice and a good sense of humour. 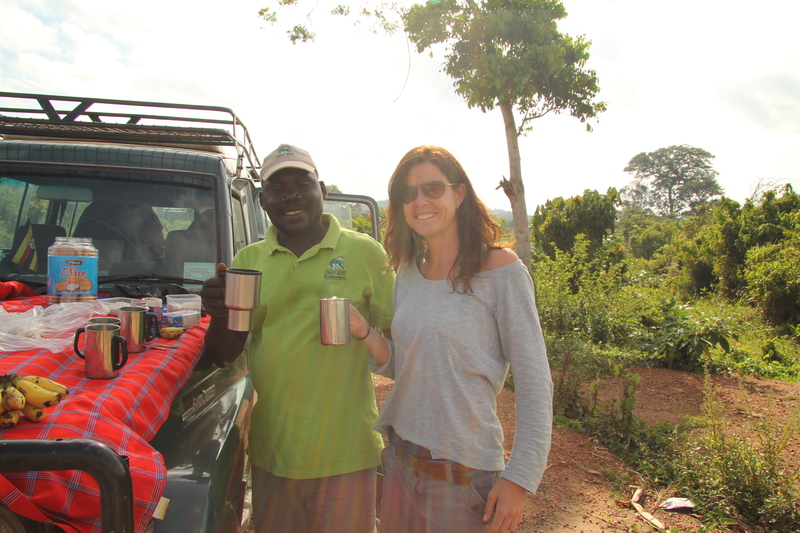 We drive a short distance in the company Land Cruiser before collecting the three remaining members of our little party – Charlotte, her brother Harry and their friend Ed. They’re from the UK and turns out, are blady good fun! 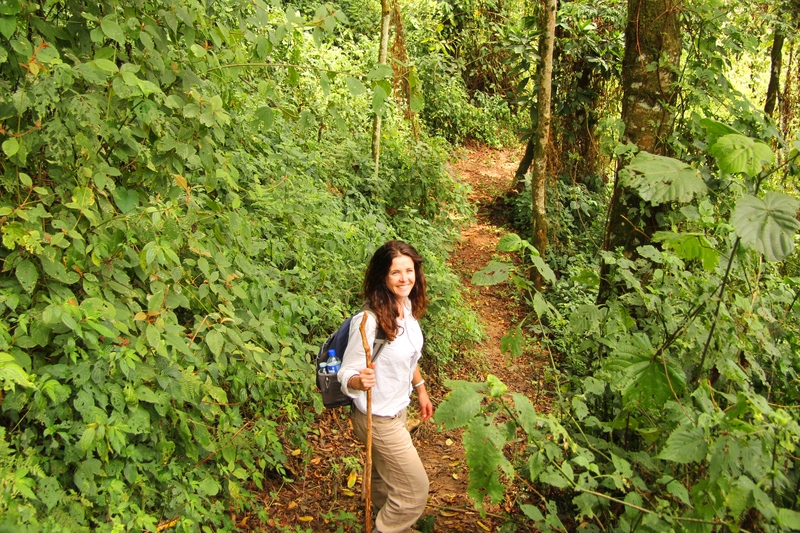 We’re headed for Bwindi, a small part of the Inpenetrable Forest on the west side of Uganda. 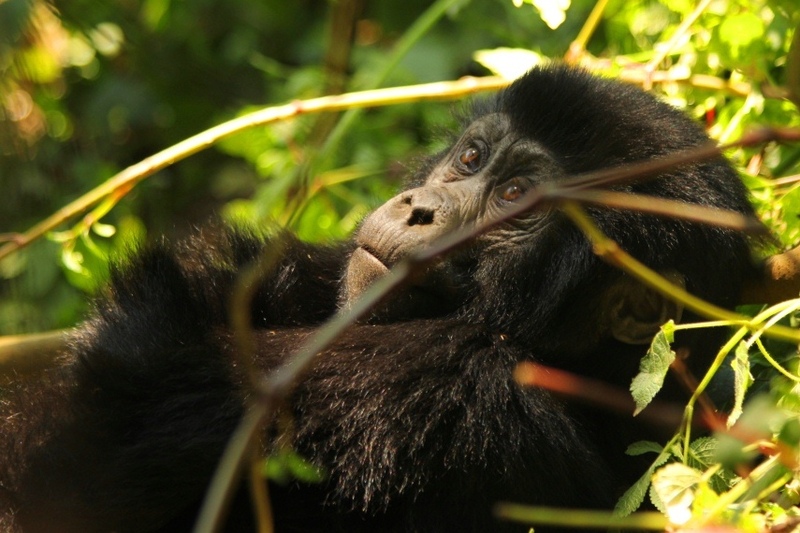 Our mission; to trek and search for the biggest primate in the world – gorillas! 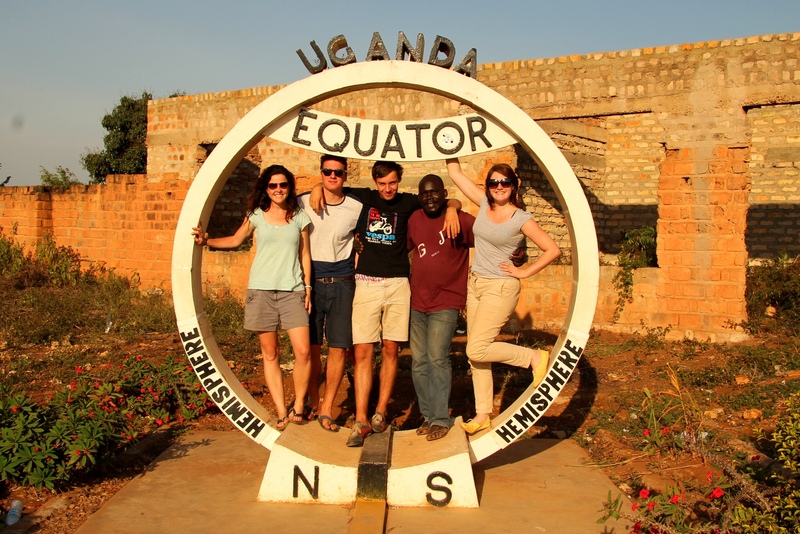 The journey takes us back through Kampala and towards the equator where we stop for the obligatory water-spinning science experiment, conducted by a local man on the side of the road. You do know water spins one way in the Northern hemisphere and a different way in the South, right? Apparently the experiment is a complete hoax as the equator line actually runs a little further to the south but the line was painted nearer the shops as it was deemed more picturesque… We take photos under the fake equator line marker and head off again. After a super slow 550kms, 15 hours and a hairy last 30kms of windy windy on dirt road, we arrive at the Mountain Lodge near the park gates and hit the sack early. Up at 6:00am, we drive to the park gate for briefing with the head guide before being introduced to our guide, Wilbur. Driving a short distance up to a different starting point, we were met by approximately 30 porters, all looking for work. Despite not needing porters for our lightweight bags, we decide to hire two porters at the cost of USH50,000 each (around £25). The rest did not get work for the day and we feel awful for not employing more. 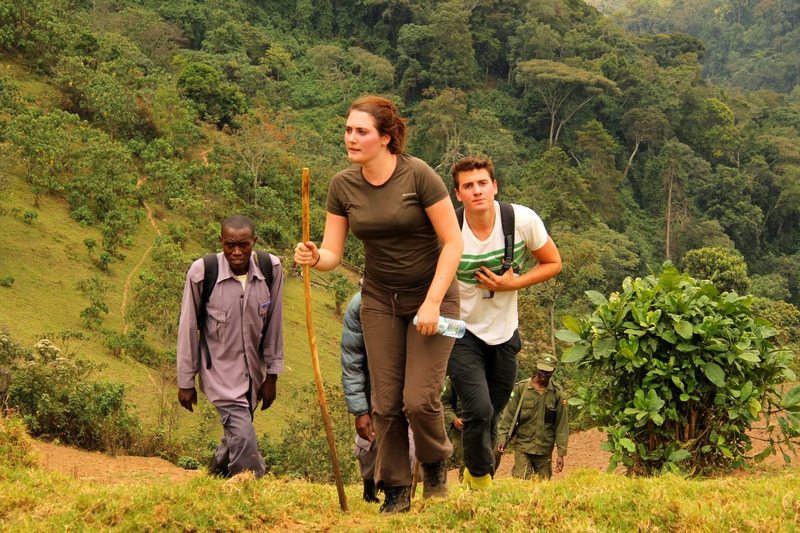 We set off… Wilbur ahead, two armed guards and the two porters, trekking to meet our scouts who are already hours ahead, tracking our family of gorillas from the place they were last seen the day before. Mostly, groups of up to 8 clients trek together but it is just the four of us which is great as it means we can move at our own pace. The forest is hot and humid. Climbing in and out of deep gullies is stunning but hard in the heat. Wilbur keeps in touch with our scouts via walkie talkie. Two hours into our trek on pretty decent paths, the call comes through – they’ve found the family. We start heading off into the thicket and down into a valley, following our guides who are hacking away at the vines and growth with machetes. 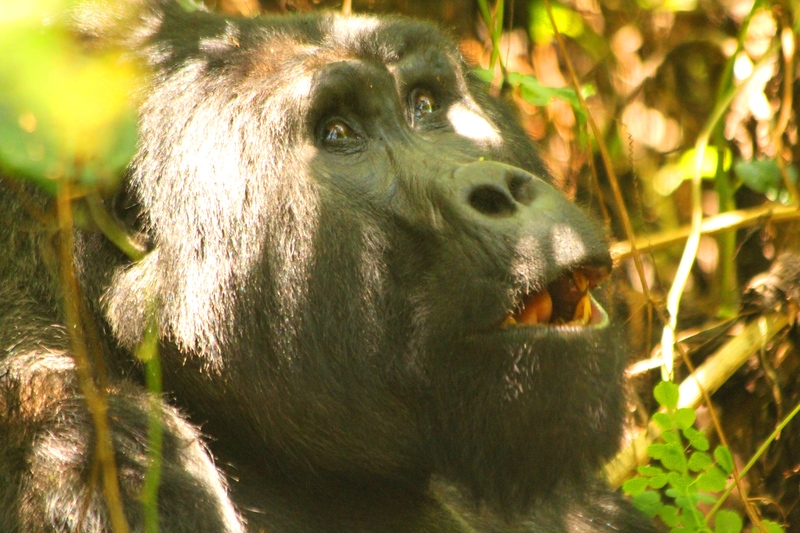 We eventually come to a small natural opening in a wall of foliage – and staring us in the face, a mere 4 metres away is a silverback, munching on some greenery – dear lord he’s HUGE!! At least he seems pretty relaxed and we all jostle for space to get a good snap of this massive cone shaped head. Before we know it, we see a very young little dude come from behind the silverback. He’s curious and spends around ten minutes rolling towards us, hesitating for a bit, munching on a stalk or touching one of us before doing a few somersaults back to the safety of papa G. Eventually the silverback moves away with his offspring, and we struggle to get close enough to them again. The guides try to hack another window in front of the silverback, but he’s busy stuffing his face with leaves and pulls down an entire branch in front of him, basically giving us the finger and signalling that the shows over. We see glimpses of the rest of the troop but the forest is super thick and all we catch are fury shapes moving in the undergrowth. Sadly we’re only allowed an hour with the family and have to head back. The hike back is tough. The day has warmed and the humidity levels are sky high. We leave the park boundaries and give our porters, scouts and guides a tip before being picked up by Cosmos. 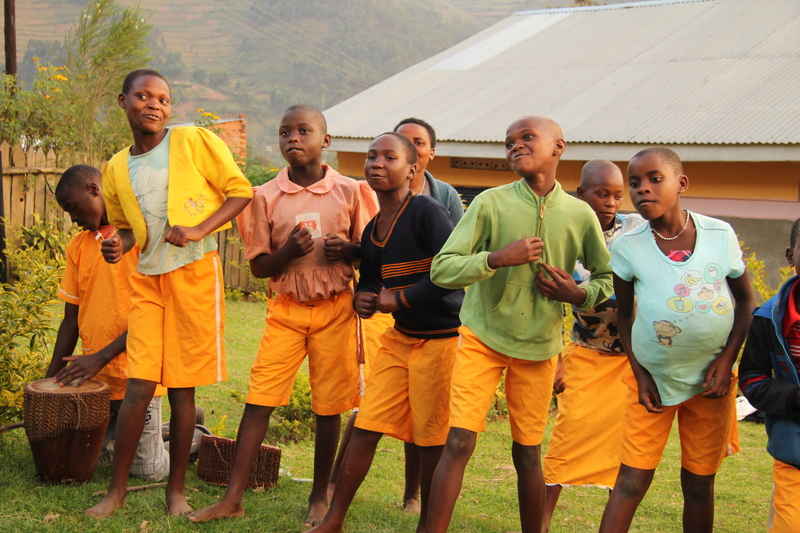 Back at Mountain Lodge, the local orphanage has something in store for us – a 30 minute display of dance and stories. The kids are incredibly upbeat and have a great sense of humour. They have us in stitches so it’s worth the donation we make to their home. We wake up at 6am, have a quick breakfast and set off again. We stop off for some local Ugandan cuisine and are treated to a table full of kaunga (posho/sadsa/pap), yams, sweet potato, “Irish” potatoes, rice, millet and four bowls of luuuurverly animal stews – goat (offal), chicken (boiled), fish (full of bones) and beef (bearable). Not my cup of tea but what an experience…! 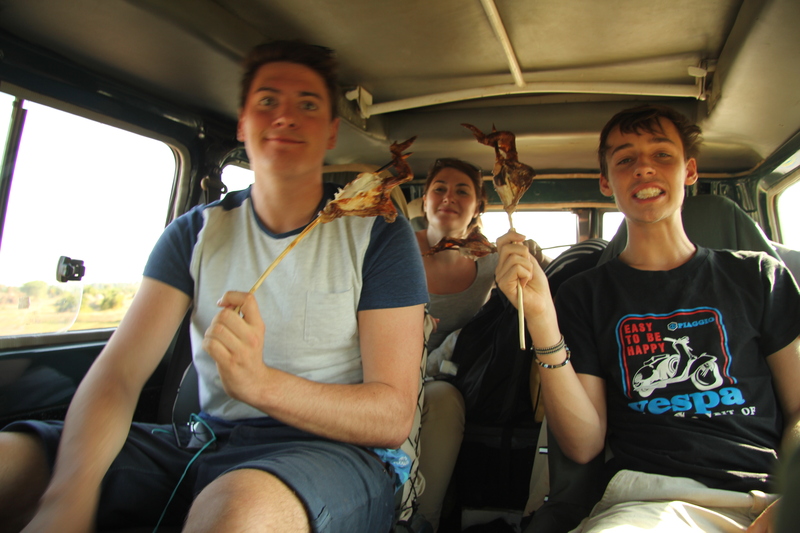 Further down the road we stop for beef kebabs and chicken on a stick, made on the side of the road over fiery drums – African favourites, super tasty and often seen being thrust into bus windows if you’re travelling by public transport. I get dropped off at Entebbe, at the Airport Guesthouse – an incredibly smart and reasonably priced lodge just near the airport, ready for my pickup at 3am the next morning. Chicken on a Stick – our favourite! 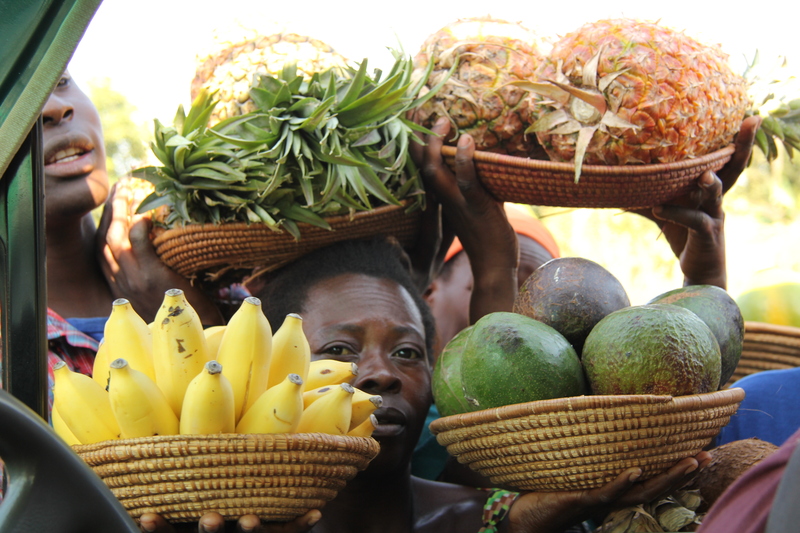 Fruit sellers, desperate to sell their goods.